E-learning "Electrical certifications - B1(V) / B2(2) / BR / BC"
Electrical certifications for non-electrical work: worker and foreman. FICTIS PREVENTION offers an e-learning solution tailored to your employees who have to perform non-electrical operations in an electrical environment. 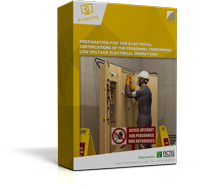 This e-learning module is intended for the personnel performing non-electrical work within the vicinity of exposed live parts or near electrical structures. Preparing the B1, B1V, B2, B2V, BR, BC certifications in compliance with the NF C 18-510 French norm, approved on December 21, 2011. Safely carrying out non-electrical work. you simply register your employees on our/your platform. the learner can access the training modules via internet and can remotely exchange with a consultant (mail, telephone, forum…). at the end of the training, the trainee is assessed. a certificate is created and ready to send. The practical training will be carried out by your trainers. Average duration of the training: 5h 30m maximum depending on the usage and the learner’s profile. This module can be customised in both substance and form. Initial training mode: the learner follows all the chapters and is assessed at the end of the course. Refresher mode: placement tests enable the learners to automatically provide the appropriate training to their knowledge. The refresher duration varies depending on the learners’ profiles. After each chapter, you gain access to a downloadable summary on “ key points ”. The learner will be able to consult this document whenever necessary. New product including numerous videos and very realistic 3D animations, for a better appropriation of knowledge by the learners. Click here to watch a sample. Download the detailed presentation leaflet.